The altimount has a 45' angle bend and should be mounted on the right side mudflap for better viewing. 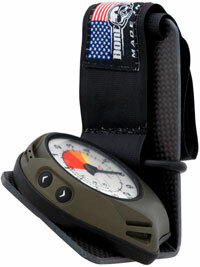 The Alti-mount is a great solution for chest mounting a visual altimeter. The Alti-mount is a carbon fiber 'L' bracket that slips into the right ring cover or mudflaps on the front of your skydiving harness and with a hook and loop fastener strap lock in place so your altimeter is in the same place every time regardless of body position. Most importantly, the Alti-mount is designed not to interfere with the operation of the 3-ring release system or cutaway handles.